Do you have questions about our Surrette batteries, or questions about solar in general? Give us a call at 1-800-472-1142. Established in 1935 in Salem, Massachusetts, The Rolls Surrette Battery Company has been a trusted name in deep cycle batteries for well over 50 years. The company relocated to Springhill, Nova Scotia, Canada, in 1959 where it is the nation's only remaining independent battery manufacturer. Their unparalleled quality and workmanship have earned the manufacturer a solid reputation in the battery industry, as one of the most reliable batteries on the market. These batteries are known for their high-cycle life, featuring the thickest plates in the industry, a large liquid reserve, and a durable double-wall construction. Rolls Surrette stands behind their batteries with some of the longest warranties in the industry, up to 10 years on certain models. The average life expectancy for these batteries is known to be in the 15 to 20 year range. 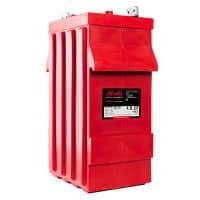 Rolls Surrette batteries are known for their rugged, dual-container construction. Each cell is encapsulated in its own inner container made with a high grade, polypropylene shell and its own heat bonded cover. The cells are then further protected with a second, high-density, polyethylene outer container. These safety measures allow the battery to still be operable should the outer container break, eliminating the hazard of a toxic sulfuric acid spill.